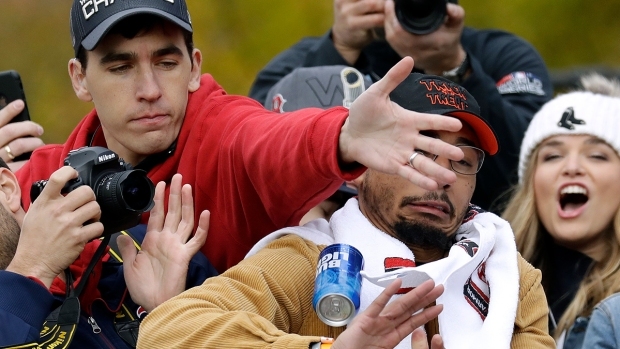 A 19-year-old Cape Cod resident was arrested after a beer can was thrown at Red Sox manager Alex Cora during the parade celebrating the team's World Series championship. Red Sox manager Alex Cora, one of the team's championship trophies and a bystander were hit by errant beer cans thrown during the team's victory lap through downtown Boston. Boston police said they arrested a Massachusetts teen on Boylston Street after they saw him throw an unopened can of beer at one of the duck boats, striking an adult male party on board. Red Sox manager Alex Cora is named in court records as the person who was hit. Patrick Connolly, 19, of Sandwich, is charged with assault and battery by means of a dangerous weapon, being a minor in possession of liquor and disorderly conduct. He was arraigned Wednesday and released on personal recognizance. Cora, whose daughter was next to him on the boat, pointed out Connolly. Detectives said they found him with a beer can in his hand. "I love Cora. I didn't mean to hit him," Connolly told officers who asked him why he threw the beer, according to a police report. Patrick Connolly, 19, of Sandwich, Massachusetts, is charged with assault and battery by means of a dangerous weapon and disorderly conduct. Another fan reportedly tossed a full can of beer at one of the boats, and it struck and slightly damaged a World Series trophy. A photo of the damaged World Series trophy after it was hit by a beer during Wednesday's parade. 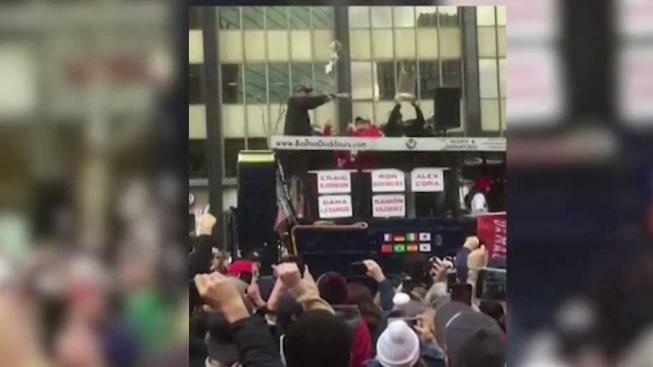 Video from the parade showed beer cans being tossed to several Red Sox players riding in the parade on duck boats, including pitchers Matt Barnes, Joe Kelly and Craig Kimbrel and outfielder Mookie Betts. Barnes could be seen catching a beer, while Betts was seen dropping one. Several people on duck boats, including catcher Blake Swihart, were observed opening beers and spraying them on the crowd. A Boston Red Sox staff member, left, tries to keep a tossed beer can from hitting Mookie Betts during a parade to celebrate the team's World Series championship over the Los Angeles Dodgers, Wednesday, Oct. 31, 2018, in Boston. Nineteen-year-old Niamh Delaney of Yarmouth was also hit with a beer can at the parade. The Westfield State University student got three stitches after a beer can hit her on the nose. 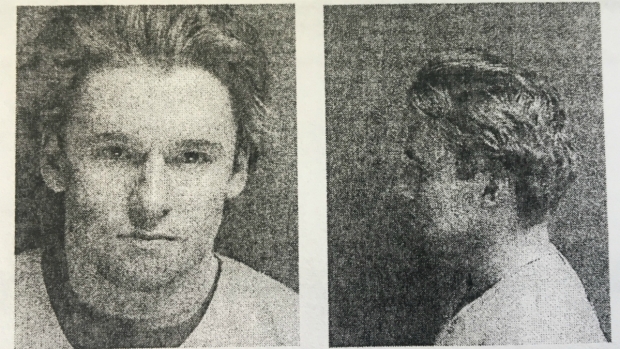 In addition to Connolly, Boston police said five others were arrested during the parade on a variety of charges. A 17-year-old male from Somerville was arrested on firearm and drug charges. Ben Carbonneau, 20, of New Hampshire, was charged with drinking in public. Nicholas San Antonio, 19, of Rhode Island, was charged with being a minor in possession of alcohol. Aliza Hacking, 19, and Santina Vanasse, 19, both of Boston, were charged with disturbing the peace. Red Sox spokeswoman Zineb Curran declined to comment, other than to say the incidents were unfortunate but didn't appear intentional. She said the World Series trophy will be easily repaired. 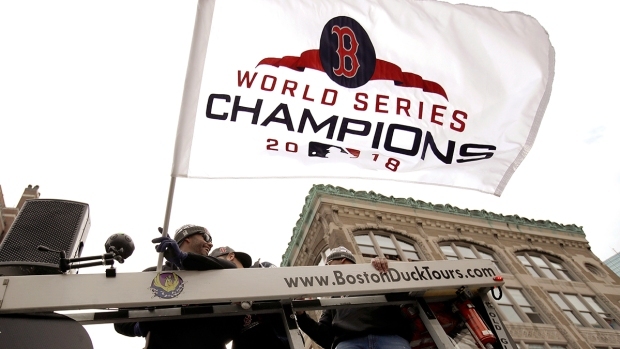 Mayor Marty Walsh had urged residents before the World Series to be respectful, saying "The Red Sox catch phrase this season is 'Do damage' — that's for the players on the field, not the fans in the streets." He said this week that public drinking would not be tolerated during the parade. Hundreds of thousands of jubilant fans skipped school and work to cheer for the team during Wednesday's parade, giving this year's Halloween a special flavor on a crisp autumn day. Many wore Red Sox gear instead of Halloween costumes. The Sox defeated the Los Angeles Dodgers in Game 5 on Sunday to bring another championship home.